England. France. Italy. Australia. Asia. I've never been outside the US, but I've always been charmed with all they had to offer. As a child I was enamored with Oliver Twist, Charles Dickens, Roald Dahl, Charlie & The Chocolate Factory etc. In my teen years, I loved watching the latest fashions on CNN's Style w/Elsa Klensch. I loved 80's British/International bands such as Duran Duran, Culture Club, Wham, Bananarama, Men at Work and Kajagoogoo. In my adult years, I fell in love with the tv show Downton Abbey (hate to see it go ~ no spoilers please ~ the last season hasn't started in the USA LOL) and British actors such as Daniel Craig and Idris Elba. My first year of blogging, I talked so much about OTHER countries PR people thought I lived in those countries! LOL Well NOW, I love SHOPPING internationally online! I think it is so cool how it's becoming more accessible to purchase goods from other countries. Of course it's even more awesome if you can actually go there (which I plan to do), but this makes the wait a little more palatable. PLUS, you find the coolest things that you can't always find in your own country and it introduces you to new brands! Do you like buying and trying things from other countries? When you get something from somewhere else, doesn't it feel extra special? I want absolutely everything here! I couldn't choose a favourite. You totally must come to Australia...then you can visit me! I also haven't been outside my home country. Yes, something that is made in another country is extra special to me. Makes me feel like I have a little piece of that place with me. I hope you get to visit your dream places soon. Such cute stuff! This is to adorable to not want to purchase love your selection great picks. 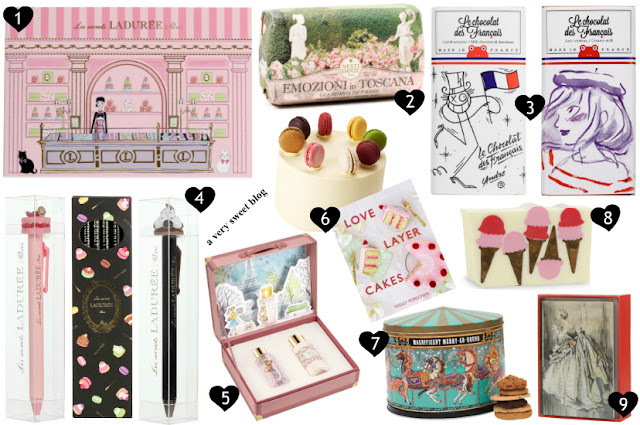 PS That Laduree notepad is too cute! It is so much fun trying products from other countries. I always love the labels! You'll have to make it a goal to take a European vacation. You will love it! I went a number of times in my 20s with girlfriends when we had disposable income. That disposable income seems to have decreased with adult responsibilities. LOL! I've never been to the USA but I plan to in the next few years once Little Tyke is older and hopefully we can meet up then, Kim! I have travelled to a few countries, Germany, China, Singapore, Thailand and Indonesia but I usually go trekking in the mountains so there's pretty much zero opportunity to purchase pretty things. I usually come home looking like I need a good scrub! LOL! I love how international shipping can really open up the world and it's definitely so much easier these days. The last time I was in Europe, I couldn't stop buying food and beauty goodies. I don't actually order internationally that much cause I hate paying for shipping and the long waits but I do cave in for Asian beauty products I really covet occasionally. very pretty post dear! lovely! AHHH Kim you are making me have a serious longing to go back to London!!! Fortnum and Mason is seriously one of my fave places in the world!!! And I can't wait for Downton Abbey to come back either!! I have been to a few countries, but non of the cool ones like France, the Europe and America, these are my most wanted to visit countries, then I would love to go to Japan and Korea, I love their makeup brands and Taiwan's food are amazing!! ♥ Absolutely adore the Laudree note book, it's so adorable, so is the pen; I can imagine eating all the biscuit in the cute Merry Go Round Music Biscuit Tin and using it as a makeup brushes holder! Absolutely, Kim! I love to disover new things especially I can't buy over here. ;) I'm a huge fan of french treasures. You always have the most interesting finds, Kim! That's so wonderful. It's so fun to find new things from other countries. I hope you get to travel everywhere that you want to go! Love the pens and pencils from Laudree Paris! I'd love to go there one day - to Laudree and Paris! It is great being able to order so much online to get a little piece of another country! I really enjoy shop online, hoy hace reason I feel very especial when my shipment arrived, Culture Club and Duran Duran also are one of my fav banda of 80's Kisses! The places you mentioned here on your post from London to Paris are my favourite places to visit. You will enjoy visiting Harrods, Fortnum and Mason, Colette and Laduree. Ive always wanted to travel and visit all those cool places Kim! I'm fascinated wit different countries and cultures. I love getting international beauty items too, but I only have a few Asian beauty products that I purchased off of eBay, and some things from Australia that I got from a swap! All the things you showed are adorable! Hey Kim, yes, I love buying stuff outside Canada. I'm sure one day you will step out of USA. I've been the countries you mentioned except Australia. That's on my bucket list. fun post. Love to read it. I also never went out of my country. But want to. I am very cautious when it comes to international shopping. But, you have to admit that you get the best deals. I have been lucky so far. Great post, doll! This is SO fun! I haven't been over ot Europe before but I am going for the first time in the spring and I am beyond excited!! This Marry Go Round Biscuit kit looks amazing!! I love your picks! You have to get out and see the world. There is so much goodness out there! Loving all of these by the way. These items are adorable! I want all of them. I haven't visited those places either (though I would LOVE to). Funny how the PR companies thought you lived abroad. hehe. And I'm with you...I hate to see Downton Abbey go. Sorry I haven't visited you in a while as I have been so busy! I love international products too. The macaroons must be amazing from Lauderee and we a few stores in the city that I must get too in the future. Thanks for sharing these items with us. I hope you are doing well and enjoy the rest of the week. There really are such great dessert and beauty options everywhere. You have to travel and hopefully you can visit my corner of the world too! Loved the inspiration, and yes, gotta love online shopping for that reason! Share lovely Birthday wishes and Exclusive Birthday wishes sms sms for your loved ones. I would love to go to Italy and France one day. The Laduree pen set is so pretty. love seeing what brands other countries have. it does feel special to have things from other places.